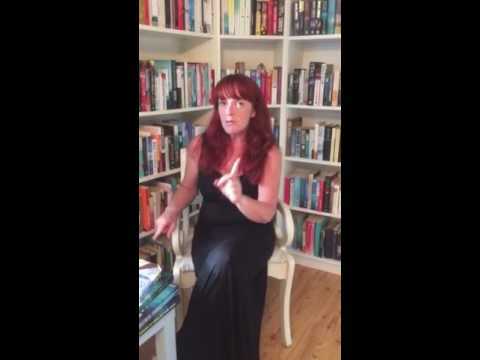 BleachHouseLibrary.ie: Book Review - "The Secrets of Grindlewood: The Queen's Quest" by Jackie Burke. Review from Mia, aged 12. 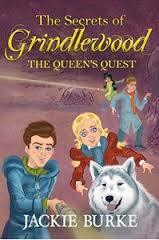 Book Review - "The Secrets of Grindlewood: The Queen's Quest" by Jackie Burke. Review from Mia, aged 12.
Review by Mia, aged 12. This book is the third installment in the Grindlewood series by Jackie Burke. The children and the animals have defeated the vile warlock, Wofeus. Life is running smoothly for the residents, until they are summoned by the Forest Queen, Lyra. She was turned into a tree by the Worfagons many years back. She wants the children's help to free her from the curse. But Queen Lyra is not as sweet as she used to be. She grows fond of Jamie's dog Timer, so she says she'll keep him if Jamie, Jemima, Luke and Abigail don't succeed in freeing her. The kids are each given an object to help them on her quest. The cure they have to find is split into four different parts; the Book of Potions and Spells, the Book of Light, the Book of Wisdom and the Book of Darkness. When these four Books are joined, they will form W.A.B.O.M. the Wandeleis Ancient Book of magic. But each Book is guarded by Gaurdians who get harder to battle every time. Great difficulties lie ahead of the children whn it is discovered that thre has been betrayal from somebody very close to the Queen. Will the children find the betrayer and uncover the W.A.B.O.M. in time? This book was an amazing read, filled with intrigue, magic and brilliant battle scenes. I especially loved the fact it's a fantasy book. I love fantasy books! Like the other installments in the series, I didn't want to put it down. Th pages were laden with mystery, secrets and feats of awesome bravery. I recommend this book for ages 9+. The Secrets of Grindlewood: The Queen's Quest is available in paperback and can be ordered, with Free Worldwide Postage, here. Book Review - "After Anna" by Alex Lake.